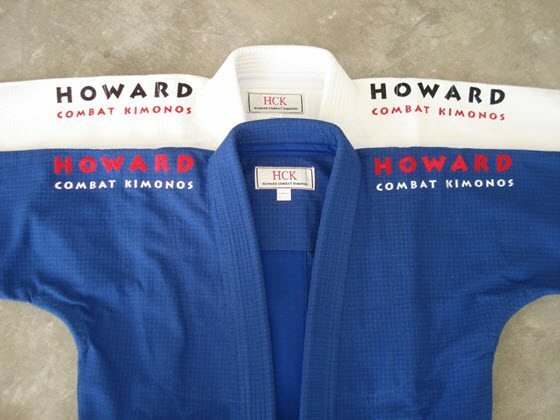 Arriving at the end of June is the new RS LITE from Howard Combat Kimonos. This is a 100% cotton Rip Stop weave Jiu Jitsu uniform that is very light weight but steely strong. The pants are made of the same fabric as the jacket. The uniform is made of 420 gram 100% cotton woven in the rip stop pattern, unlike the typical rip stop weave that is a poly/cotton blend. The all cotton weave makes for a very breatheable and comfortable fabric, and a balanced strength within the fabric. Poly/cotton blends are not as breatheable and because polyester threads are stronger than cotton threads, there is an imbalance of strength to the fabric which can result in the fabric tearing under stress, such as pulling and tugging. Jacket features include stiff felt collar, setsugi stitching, taped seams for a more comfortable finish, and all logos are embroidered. 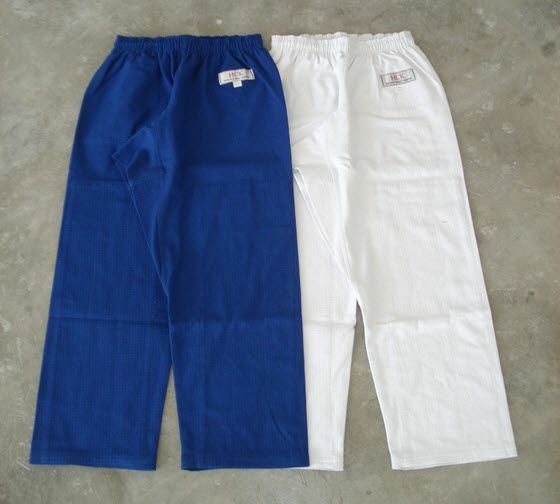 The pants are made of the same 420 gram fabric, with a 280 gram twill padding from the the top of the thigh all the down to the end of the pant cuff, elastic waist band with an inner drawstring. All uniforms come in regular, short/stocky and tall/lean sizes. The RS Lite is available in White, Blue and Black. 420 gr. cotton Rip Stop weave. Very light and very strong. Felt collar, setsugi stitching, taped seams. Pants made of 420 gr. cotton Rip Stop weave. White belt. Embroidered logos. I have a lot of Gi’s, at least more than most people, I think. I have two Gi’s that I will never part with, my Do or Die Hyperfly and (now) my HCK Ripstop. This Gi is downright amazing. I don’t think words can describe how awesome this Gi is. From the cut, to the pants, it’s spectacular. I was blown away since day one with this Gi. It’s solved many issues I thought would always be standard on Gis. HCK is known for a seam in the back that I originally had my doubts about, but after rolling hard in this Gi for a weeks now I can say put those doubts to rest. I have had no issues with back scratching or uncomfortable rubbing and I predominately play guard. A lot of attention to detail seemed to be put into making this Gi as can be seen in the stitching and cut. EVERYONE SHOULD BUY THIS GI. I expected the light ripstop material, but when the Gi arrived I was surprised with a thicker ripstop weave more suitable for year round grappling. It’s no ultra light Gi top, but it’s definitely not heavy, middle of the road is how I’d describe it in terms of weight. Awesome Deals on Lightweight Gis Await You at MMA Warehouse! To me, it has the perfect amount of flare on it. Some nice simple embroidery on the shoulders and they leave it at that. The yellow and white really do pop off of the black of the Gi as well. Even still after a dozen washes or so. Aesthetics wise it is again one of my top two Gis. The cut is magnificent on this thing. It has a tailored cut that leaves out the excess material your opponents usually can grab. HCK does this while still managing to give full non-restrictive motion to the arms. The sleeves are finished off with extra thick seam tape around the wrist on the inside. I have never been the biggest fan of Ripstop in the past as I feel it’s too easy to grip and it turns unbreathable after sweating in it, but the thickness of this Gi makes it tough to grab and somehow it doesn’t lose its breathability like I’ve experienced in the past with thinner Ripstop weaves. One of my favorite features about the HCK Ripstop Lite is the collar. It’s comfortable but probably the sturdiest collar I’ve ever worn. My training partners have complained vehemently about it. Which is good thing for the wearer, me, obviously. Even me just pickup up the Gi by the collar I notice it’s difficult to get a full grip around it. Very impressive. 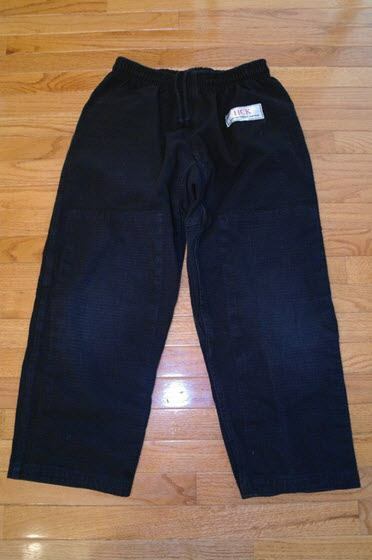 The pants are the same material as the top, which makes them heavier than normal cotton pants or even the lighter versions of Ripstop, but they are super tough. From above the knee extra reinforcement is made all the way to the bottom of the pant (similar to JustGiPants). Something I have heard every single BJJ practioner I know of mention that they want in Gi pants. Now, the most obvious addition to these pants is the elastic waistband. I was a non-believer myself until I actually put them on. Maybe it’s the fat lazy American side of me, but man are they comfortable. These are the only Gi pants I have that I never have to readjust in class. The elastic band and the drawstrings on the inside of the pant means they never get undone which is extremely conveinent. If good performing Gi pants are what you are looking for, look no further. The pants durability has been great for training and the weave of the pants makes it more difficult for my opponents to grab, unlike the thinner Ripstop weaves which are extremely easy to manipulate. The crotch has a diamond shape cut to allow for greater leg movement without worrying about tearing the pants. 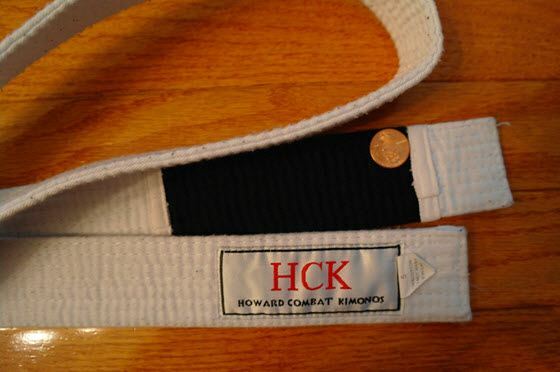 Unlike most companies HCK sends a white BJJ belt with every Gi. A nice add on if you’re a white belt. The belt isn’t too thick and ties into a “super knot” nicely. It has the standard black box for stripes and a small HCK logo on the other end. It ties much better than the BreakPoint belts I’ve been using which, although sturdy, come undone much too often. Howard Liu from HCK was 100% awesome and professional from start to finish in me receiving my Gi. You can really tell he cares about his Gi’s and the people they are going to. Do note though that HCK uses an international size chart that differs from the typical A1-A4 size charting you’re used to seeing, so be prepared to get your measurements and give HCK a call with any questions. 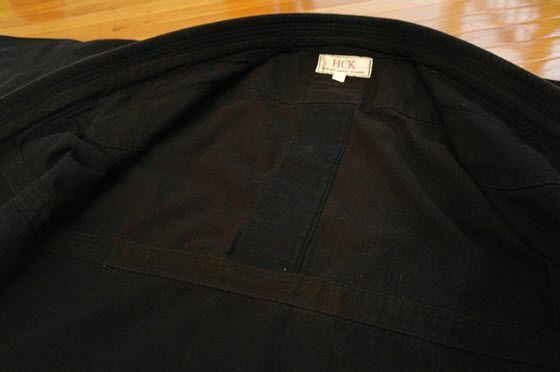 HCK, for a $10 fee, allows you to get a different size pant with the purchase of your Gi. I myself am typically an A3 top, A2 bottoms. If that is typically what you wear, with HCK I’d venture to guess a size 5 top (at 195lbs 5’10” the 5 fit me perfect) and 4-5 pant would do you justice depending on your waist. HCK will no doubt help you out in your selection. 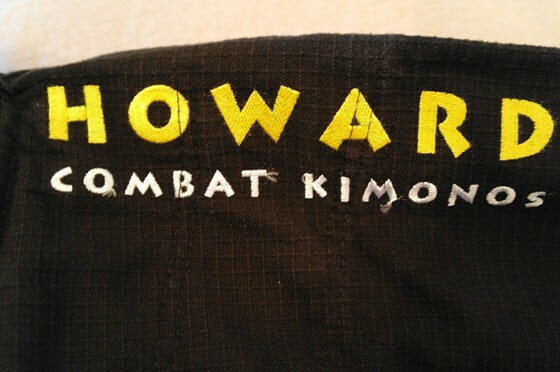 Howard Combat Kimonos (HCK) is known for building rock-solid gis and some really cool, unique BJJ belts. 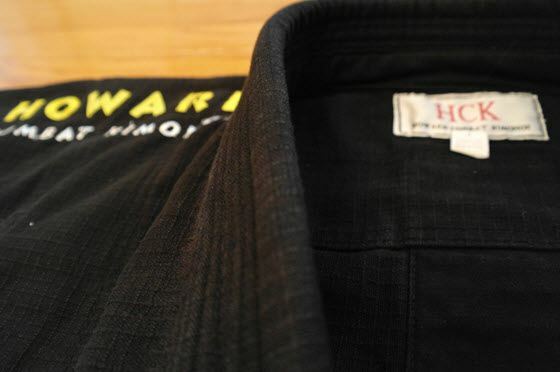 The craftsmanship is top notch and we haven’t known anybody who owns an HCK gi and doesn’t love it. It comes highly recommended on every message board and website and this is no different. The gis are incredibly durable and sturdy and the pants are known for being just as tough as the jackets. Howard Liu is an awesome guy and posts frequently on message boards should you ever need to get ahold of him outside of the contact e-mail on his website. The collar came apart on this gi, but this is the only time we’ve ever heard of that happening. Seems like a case of Murphy’s law. The one gi that gets reviewed online is the one gi that has a factory defect. 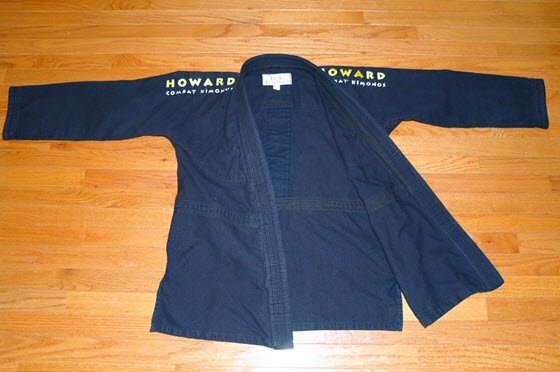 With top notch customer service (see the comments section below), Howard replaced the jacket with a brand new one, and was super helpful throughout the process. WELL DONE HCK! To purchase HCK’s RS Lite gi, click here. At $125-$135, this gi is a total steal. Thanks to Howard for keeping his gi prices where they should be! Some info on shrinkage would be great please! Some better pictures of the gi actually being worn would do wonders. Not sure why reviewers always leave this out. The fit is pretty much the most important thing to me. Comparing the fit to other gi’s you have is helpful. Speaking of which – those pants look *extremely* baggy. Are they? Or is it just the pic? What about the sleeves? Are the they also loose? I experienced very minimal (if any) shrinkage across the board. When I first put the Gi on it felt like it was tailored to my dimensions and even after washing AND drying it still does. I don’t think the length of the pants shrunk at all and the pants might just look baggy in the photos as they are not actually baggy. I did talk about the cut/fit of the Gi in the above review, but will expand upon that section for my next review thanks! The sleeves are some of the slimmer out of the Gi’s I own, BreakPoint, Tatami, Do or Die, Ezekiel, etc. Sleeve slimness wise I’d say they are probably closer to the Tatami than any of the other brands. The Gi is a very very good fit. 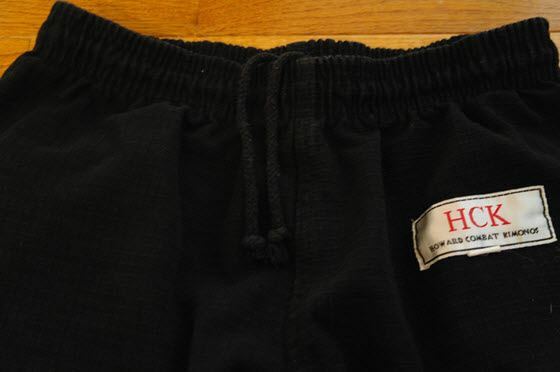 It’s hard to compare to most Gi brands because HCK really does their own thing. You should be able to see in the very first photo how much space is in my sleeve with my arm outstretched. You can click on the images and zoom in. Unfortunately I have to minimize their size for uploading. Thanks for commenting here Dan! And I agree. There’s a limit to image size because we don’t want the page to take too long to load for people with slower connections. Sorry about your collar situation. Please send it back to me so I can take a look at it. From the picture, I can’t tell if a thread broke, or if it was a factory defect. In any case I would like to examine it. Once received, I will send you a replacement top so you can continue with your review. Thanks for letting me know about this, as it helps me improve my product. Did you get a replacement jacket yet? We’ll have one in our hands soon. We were debating on whether or not to send it back, but Howard was very adamant on getting to the bottom of the issue. He doesn’t like bad product out there and wants to make sure that it doesn’t happen with anybody else. Love the review of this Gi. Sounds like the type of Gi I’m looking for but I’m a little unsure of the RipStop jacket. 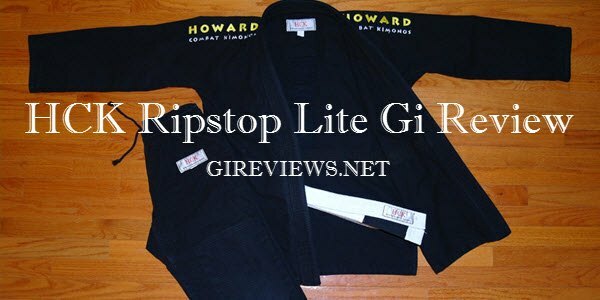 The only ripstop gi I’ve seen is the Gorilla and it’s terrible IMO. Hate the look, feel and fit of it, its like a TKD top. The only lightweight Gi I’ve owned was the Gameness Pearl (550grm). I didn’t mind the material (hard for opponents to grip) but the collar was FAR too thin and flimsy. Does the rip stop material still have a solid feel to it? This Ripstop Gi is NOT like the thin Ripstop material, this Gi is tough as nails. The collar is extremely hard for people to grip as well, it also doesn’t feel uncomfortable at all. It’ comfortable, tough to grip and extremely solid. Also, HCK hasn’t had anyone else complain about the collar coming undone like mine did at the edges, so it could have just been a defective Gi. I should have a new top soon and I will let you know! You were so mad when that happened haha. 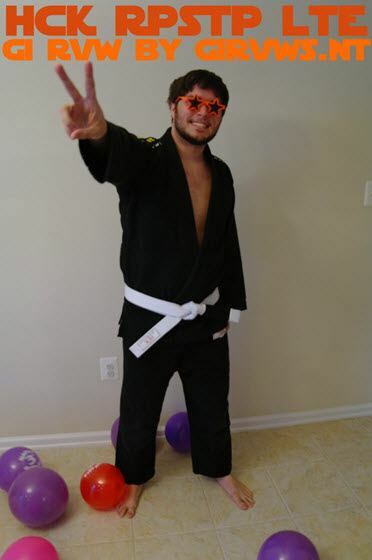 Dan loves this gi everybody! Just received Dan’s return. Yep, this is a factory defect. 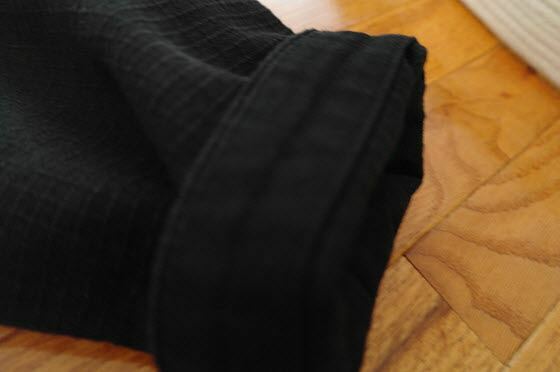 The lapel cloth on this particular gi wasn’t cut wide enough to allow the fabric to completely fold under the collar to allow thread to be sewn through it. Even though this does not affect the the integrity of the of the collar, as there are 6 rows of stitching to hold the collar to the body of the jacket, this is a bad finish. I apologize for this, and I will send it back to the factory for their review and to remind them to finish the uniforms correctly. I have sold over 150 of these uniforms since the beginning of July, and luckily, this was the only uniform that has had a defect. I have not received any other complaints. A replacement jacket has already been sent out for your continued review. As with life, nothing is perfect. However, if there is a wrong to be corrected, I will always correct it. HCK prides in superb customer service. And that, my friends, is how you handle customer service. Thanks Howard! When my next batch of the Competition Single comes into stock, I will send that to you for a review as well. This uniform has been around since the beginnings of HCK, but a lot of newer guys in BJJ now really do not know very much about it, since it is a heavier weight uniform. ETA is sometime in November. Got the Gi top, looks great! Can’t wait to get back into my HCK!